To Our GMG Readers: My apologies for our being behind in posting this series for Catherine Ryan. The following story, “Access,” is actually part three of a terrific three part series that Catherine wrote titled, “Round Up of Local and National Art Stories,” featuring the local and national common threads of advocacy, aplomb, and access.” We’ll start with part three, Access, and work backward as this is great content relevant to our local artists and art scene. Local and national common threads include advocacy, aplomb, and access. Oh, and Amazon. December 5, 2013 was a huge art news day. Last up below: access (public). Open Content: Sometimes my research and work has required obtaining permission for images which can be an issue and expense. In 2010, I began to hear from more and more museum curators a growing rumble that the “barn doors would be thrown wide open”. That particular quote was the most memorable expressed to me, but all were variations on the same issue: public domain and open content. Joining the National Gallery of Art, Yale University, Los Angeles County Museum, and Harvard, in August 2013 the J. Paul Getty Museum announced its complete “commitment to sharing digital resources freely with all….It is now the mark—and social responsibility—of world-class institutions to develop and share free cultural and educational resources.” And with that bumped 4600+ eligible images on line and the bigger story and message went viral. This means optimum, quality digital resolution to linger, study, and copy– no more sour imprints and hassle for many works of art. Congratulations James Cuno—who has MA and Chicago ties. Google Art Project has a part in this shift. We’ll see whether this conversation increases in 2014, and other topics concerning museum goals and values (free admission– without allowing the institutions to decay, policy debates, etc). National trends: Crowdsource funding remains strong and in the news. Spike Lee used Kickstarter, and here at home Felicia Ciaramitaro published the first gorgeous book of her Sicilian cookbook series. Local Rob Newton Cape Ann Community Cinema successful and oh so deserving Indiegogo campaign raised $54,000. Crowdtilt gained ground. High Line ripple effect and references are everywhere and we all benefit. Amazon tries its hand at selling original art on line (while 20 x 200 closes). Maker movement/DIYcontinues to grow (Etsy, YouTube, and Pinterest). 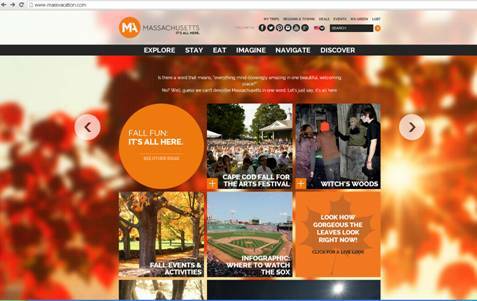 Better programming and better websites: NEA, MOTT (above), Essex National Heritage…a long list of improved websites. Gloucester has this down, too, whether new events such as Cape Ann Ceramics Festival, curated by Susan Hershey, Jenny Rangan & Seyrel Williams, or mainstays amped up (see Maritime Gloucester Museum: Schooner Festival / lobster bake as one of many examples!) Ah, the floater home page! Communication: I’m impressed by our local businesses, institutions, Cape Ann Chamber of Commerce and the Rotary; all combine to spread news, host, feature, and put up with plastering of flyers and the like to help the creative arts. Plus we are super lucky because local media covers the arts scene. Thank you, thank you WBUR, the Artery, Art New England, Boston Globe, seARTS newsletter, Cape Ann Beacon and Gloucester Daily Times. Sadly for us but good news for Hamilton – Wenham, editor Jane Enos has left the Cape Ann Beacon for the Chronicle. Good luck Jane! Welcome to the new editor, JC Lockwood! When I think arts access, the award-winning blog Good Morning Gloucester has to be the apex, having redefined shared community information, and yes arts guide. It has reached beyond our geography. One quick art example: Master Drawings from the Minneapolis Institute of Arts will feature a Gloucester snapshot of the house depicted in the Edward Hopper drawing, Double House which I identified and GMG shared. I have worked with this museum’s print and drawing department, and met Rev. Richard L. Hillstrom, an art collector who gave the Hopper drawing to the museum. Rev. Hillstrom put together a significant collection of religious prints and drawings for the Lutheran Brotherhood; not surprising with his knowledge and eye, with the collaboration of expertise of the print & drawings department (at that time the curators, former Director Richard Armstrong, Dennis Michael Jon, and others), and with the incredible holdings at this national treasure. In 2013, Jon juried the North American Print Biennial which was exhibited at Boston University. The Director of Prints and Drawings, Tom Rassieur has MA and NY ties. Placemaking and Collaboration: For regional and national networking, resources, and inspiration, 2013 was a banner year for Ma Smarth Growth, 10 years prescient and we’re catching up; Project for Public Spaces –and not only for another Detroit story; Essex National Heritage, Trails and Sails even bigger; and from Denver, CO Callforentry.org which remains one of the most comprehensive art source tools for integrating free artist submissions with the managing of juried exhibitions and competitions. Austin, TX: Frankly the glorious work by James Turrell is nearly always big news. 2013 is no different. In addition to the Guggenheim show and other projects, more than 1000 people attended the opening of James Turrell’s Skyspace, The Color Inside, the most recent commission by Landmarks, the Public Art Program at the University of Texas at Austin. As founding director of Landmarks, one of Director Andree Bober’s game changing assertions in my book was the brilliant move to entice the MET to bring 28 modern and contemporary sculptures as long-term loan in 2008. What must be hundreds of thousands of people annually can experience a public art master class; engage or not. The logistics were not simple; I know, but the idea is big and simply beautiful. Along with this critical core, policy ensures that 1-2% of ongoing capital improvement is set aside for acquisition such as the Turrell Skyscape. Upcoming Monika Bravo. Bober participated in the HarborWalk Public Art Challenge along with the Peabody Essex Museum Curator of Contemporary Art, Trevor Smith;Cambridge Seven Associates (architects Peter Sollogub and Chris Muskopf); the Honorable John Bell; and artists Phil Cusumano, Morgan Faulds Pike and Jeff Weaver. How fantastic that these jurors volunteered their time and considerable talent to help the artists and this process. Beverly, MA, is an NEA Our Town recipient. Contemporary artist and MacArthur fellow, Anna Schuleit Haber (Rhode Island School of Design (RISD), is currently working on a site-specific new work for Montserrat as part of this Our Town grant. In 2010 she completed Just a Rumor for UMass Amherst. Boston: UK artist Luke Jerram’s Play Me, I’m Yours street pianos was installed in Boston and its environs. 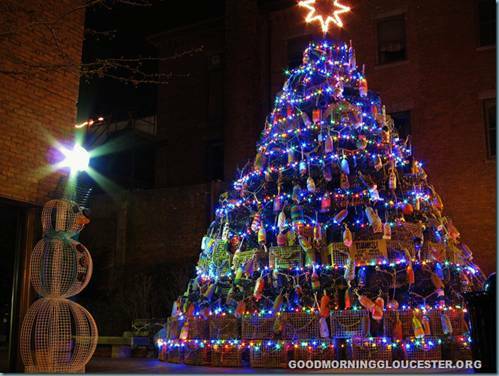 Gloucester tradition goes public art: Back in 2001, the community transformed off-season lobster traps—generously and temporarily loaned– into Gloucester’s Lobster Trap Tree.The aspirational, David Brooks/Cape Ann Art Haven, made the community connections even stronger with the addition of donated buoys, hand painted ever since each year by youth in our community. Gloucester: Artist Juni Van Dyke’s radiant and ongoing direction of the Rose Baker Senior Center Neighborhood Quilt project made the news as some of the completed works traveled…in town, exhibited at both Gloucester Lyceum & Sawyer Free Library and City Hall. Her own confident work across media is at Flat Rocks (browse those flat files!) and Jane Deering. Gloucester, MA: At the direction of Mayor Kirk, Gloucester commissioned 3 contemporary artists for new public art with funding support from the Seaport Advisory Council, Commonwealth of Massachusetts. 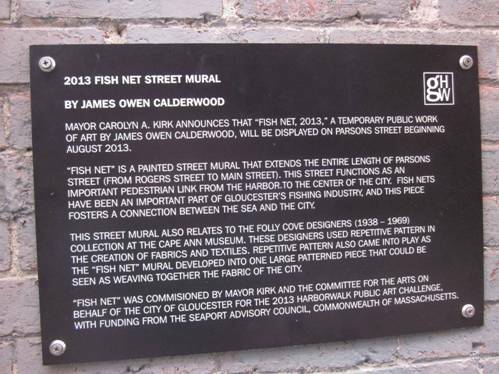 Artist James Owen Calderwood completed the 300’ Parsons Street mural, Fish Net, which was selected as one of the extraordinary public space examples at Ma Smart Growth Alliance ABX placemaking booth (photo above).Cambridge Seven Associates architects designed the Gloucester HarborWalk. 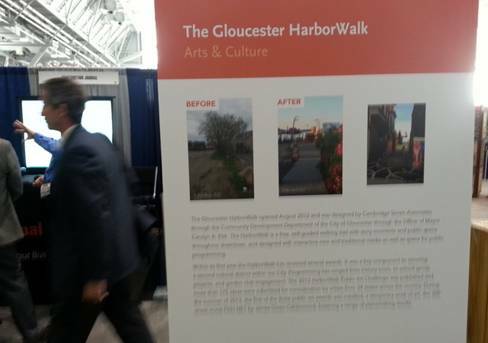 Artists Justin Desilva (RISD) and Bartek Konieczny (MA College Art & Design) are currently at work on their winning Gloucester HarborWalk Public Art Challenge awards. Tricia O’Neill / Signs unique fabricated the gHW plaque and has a connection to the next public art listed; she’s painting from the crane.Boston, MA: September 19, 2013 photo © Mike Springer / Gloucester Daily Times, “Taking art to new heights; local painters carry out high levelBoston project”. 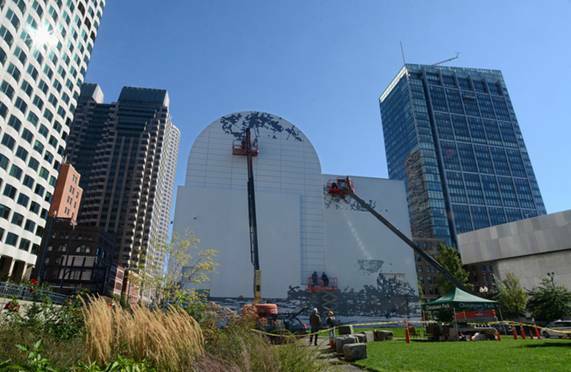 Matthew Ritchie’s Remanence: Salt and Light (through fall 2014), is the 2nd temporary mural on the Dewey Square ventilation building, commissioned for the Institute of Contemporary Art/Boston and Rose F. Kennedy Greenway Conservancy, and made possible by the MA Department of Transportation, Boston Arts Commission, and City of Boston, and private donations and support. Boston, MA: September 19, 2013 photo © Mike Springer / Gloucester Daily Times, “Taking art to new heights; local painters carry out high levelBoston project”. Matthew Ritchie’s Remanence: Salt and Light (through fall 2014), is the 2nd temporary mural on the Dewey Square ventilation building, commissioned for the Institute of Contemporary Art/Boston and Rose F. Kennedy Greenway Conservancy, and made possible by the MA Department of Transportation, Boston Arts Commission, and City of Boston, and private donations and support.Rockport, MA: In 2013, there was more local awareness for “temporary” public art. In Rockport, MA, artist and architect–and HarborWalk Public Art Challenge semi-finalist for Then and Again, a proposal for a temporary winter installation–Rob Trumbour secured the OK to design a site-specific summer installation with his Wentworth architectural students (Artforming Summer Build). 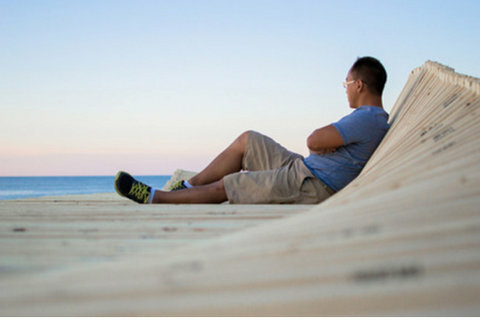 See a detail from the installation at historic LumberWharf, Rockport. 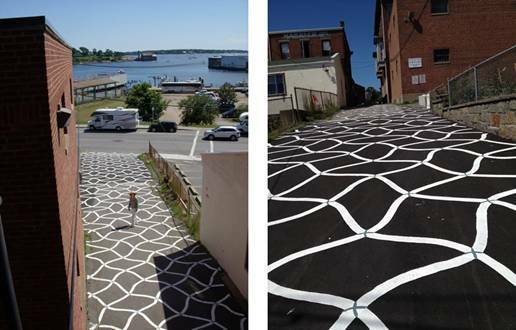 Rockport, MA: In 2013, there was more local awareness for “temporary” public art. In Rockport, MA, artist and architect–and HarborWalk Public Art Challenge semi-finalist for Then and Again, a proposal for a temporary winter installation–Rob Trumbour secured the OK to design a site-specific summer installation with his Wentworth architectural students (Artforming Summer Build). See a detail from the installation at historic LumberWharf, Rockport. Museums re-opening: Harvard, Clark and our very own Cape Ann Museum. Boston: Will Boston’s Mayor Marty Walsh name an arts representative? Gloucester: To address the lack of senior/artist and live/work space it makes sense to pursue a goal of culturally-centered, affordable housing in Gloucester. 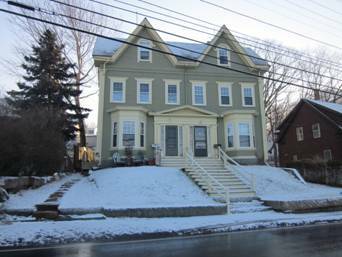 Artspace will come to Gloucester when $15,000 is raised for their site visit and feasibility study. Any contributions or funding ideas please contact Veronica Morgan. This is good stuff. What a round-up! And it’s helpful to have all this info brought together this way. Thanks, Kim! Thanking Catherine–she is amazing to have put this together for us!! Catherine Ryan created this–I just posted Dave. Catherine has put together an informative and interesting current report of the arts that continue to play such an important part in the history of Gloucester. Nice to see the GMG crew a part of this history that includes state and national recognition. Thank you Kim, for being a part of this history and for posting this series which brings recognition for the arts which are uniquely Gloucester. Thank you Mary for your kind and thoughtful comments. Catherine is such an asset to the community. Her position as city-wide arts advocate is entirely volunteer. As you can see, she does simply an amazing job of bringing us all information on the current art scene and grants available, as well as bringing a diverse group of artists and community-minded people together!